The Daily Caller mocked and objectified transgender students in its report on a recent legal victory for transgender youth, a report that also featured the long-debunked claim that transgender students will engage in inappropriate behavior if they're allowed to use restrooms and locker rooms that match their gender identity. The supreme court of Maine has issued an opinion declaring that transgender children in the state's public schools must be allowed to choose their own bathrooms despite their genitalia or how uncomfortable other students may feel about it. The 5-1 decision, which came down on Thursday, marks the first time any state's high court has ruled that transgender kids can use the bathroom with which they identify rather than the one matching their biological trappings, reports the Bangor Daily News. The case, which originated in 2009 and stagnated for years in Maine's courts, involved a fifth-grade student who wanted to use the girls' bathroom. School officials said no because the student was not, in fact, a girl. Jennifer Levi, director of the Gay & Lesbian Advocates & Defenders (GLAD) transgender rights project, was pleased with the outcome. "A transgender girl is a girl and must be treated as such in all respects, including using the girls' restroom," Levi stridently insisted. Owens then listed other cases in which transgender people and their advocates have fought to ensure proper facilities access, including in California, where transgender students statewide may now use facilities and participate in programs that match their identities. 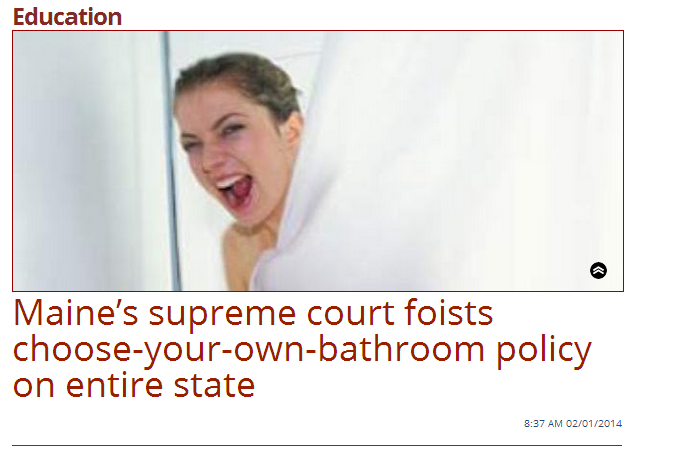 California's experience with the law debunks Owens' "choose-your-own bathroom" claim and his suggestion that intimidation and harassment will likely result from the Maine court's ruling. There hasn't been a single instance of misconduct reported by California schools. In Los Angeles, where a trans-affirmative policy has been in place for nearly a decade, "we have had no instances of anybody pretending to be transgender," Dr. Judy Chiasson, program coordinator for Human Relations, Diversity and Equity, told Equality Matters in a recent interview. As with other districts implementing California's new law, Los Angeles has long determined eligibility for transgender protections on a case-by-case basis. According to Chiasson, "we don't let children [declare] 'I'm gonna be a girl during P.E. and the rest of the day I'm going to be a boy." Maine's experience will likely be no different. As Owens himself noted, the Supreme Judicial Court's opinion stated that it would not "permit students casual access to any bathroom of their choice," but that districts must allow students access to the facilities of their choice if "it has been clearly established" that they're transgender. Schools' experiences with trans-affirmative policies demonstrate that there's no harm in allowing students to live in accord with their gender identities. In fact, it's essential to the well-being of transgender people. What does cause tremendous harm is the type of transphobic cyber-bullying practiced by Owens and others in the right-wing media. Owens' coverage regularly depicts transgender people as laughable, confused, dangerous, unstable, and freakish individuals worthy of scorn. The disproportionate violence and harassment faced by the transgender community doesn't occur in a vacuum. It's the direct consequence of the very sort of ridicule and objectification shamelessly practiced by The Daily Caller.